In a medium saucepan, add the cranberries, orange juice, water, fresh ginger, sugar and cinnamon stick. Turn the heat to medium and simmer for 10 minutes, until the cranberries have softened. Run the cranberry syrup through a fine-mesh sieve and press the cranberries to release any juices; transfer the syrup to a large pitcher. Pour in the Cointreau and wine; give it a good mix. 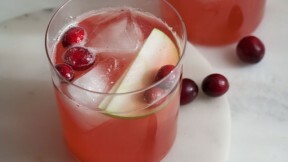 Add the reserved cranberries, orange slices and sliced green apple. Transfer to the fridge to chill for 1 to 2 hours. Stir the sangria before serving. Serve over ice.